About 300 priests serve in the Archdiocese of the Military. Mary Smith, Catholic New York Governor Al Smith's, sister, on Al Smith and his father being one of the first to cross the Brooklyn Bridge: "I remember Mother sitting at home saying 10 rosaries." Actress Mia Farrow still wears the medal of Our Lady of Perpetual Help around her neck that her father gave her when she was 12 years old. "My faith has helped me through many difficult times." According to France's National Institute for Statistics, there are 20,115 French citizens 100 years old or older. In 1990 there were 3,760 French centenarians. Want to purchase a cup of coffee? That'll cost you three Our Fathers. Want a Coca-Cola? Five Hail Marys and a Glory Be. A Cappuccino? Four Our Fathers. Holy Spirit Church in Zagreb, Croatia, has opened a "prayer cafe" in the parish hall. Said Salesian Father Damir Stojic, "A lot of kids used to head for neighboring cafes after Mass here. We came up with this scheme for persuading them to hang out at the church instead." Other parishioners have taken to the idea as well. Cincture - Rope belt with three knots worn by Franciscan monks. The knots represent the vows of poverty, chastity, and obedience. Citizens of the Catholic country Monaco are not allowed to gamble within Monaco, a country known for its casinos. Monegasques pay no income tax. Feeling pent-up in the Vatican, Pope John Paul II snuck out to ski and hike in the Italian Alps over 100 times before being discovered by a 10-year-old boy who pointed at Pope John Paul II and shouted, "The pope! The pope!" In 2005, there were 1.12 billion Catholics, up 1.5% from 2004. There were 406,411 priests, +.01%/520 priests, Asia (+3.8%) and Africa (+3.6%) registered the greatest increases in vocations while Europe and the Americas showed a decline in vocations of -.05% and Oceania decreased -1.8%. Africa has 20.3% of the world's priests, Europe has 48.8%, Americas 30% and Oceanea 1%. Is your last name Zolp as verified on your birth and Catholic baptismal certificates? If so, Loyola University in Chicago will provide you with a full four-year scholarship. 3% of Iraq is Roman Catholic. The Catholic Church has been in Iraq for 400 years. According to the 2002 census, Buncrana was named the most Catholic town in the Republic of Ireland at 94.3%. The Republic of Ireland was 88.4% Catholic in 2002. The number of U. S. Catholic clergy declined during 1981-2001 from 58,534 to 45,713 while the U. S. Catholic population grew by 14,000,000/27%. 40 is the mystical number signifying penance. U. S. Catholicsm grew by 1.5% in 2009 with 68 million Catholics - more than any other U. S. religion. Newt Gingrich, former Speaker of the U. S. House of Representatives, converted to Catholicism on Holy Saturday, 2009. A lifelong Baptist, Speaker Gingrich said his conversion was a ten-year journey. 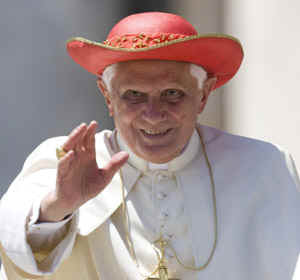 The hat Pope Benedict XVI is wearing has been nicknamed saturno/Saturn Hat because it resembles the rings around the planet Saturn. Need a prescription, laboratory test, x-ray or ultrasound at the Vatican? That'll be 75 cents, please. Which countries have the most Catholics? Brazil, Mexico and the United States. The United States has more Catholic colleges and universities than any other country: 213. Looking for a spouse? Pray to Saint Raphael, the Patron Saint of Happy Meetings, advises the Catholic Bishops' Conference of England and Wales: "You were sent by God to guide young Tobias in choosing a good and virtuous spouse. Please help me in this important choice which will affect my whole future." "Saint Raphael, you were sent by God to guide young Tobias in choosing a good and virtuous spouse. Please help me in this important choice which will affect my whole future. You not only directed Tobias in finding a wife, but you also gave him guidelines which should be foremost in every Christian marriage: Pray together before making important decisions. Amen"
What did Catholic mobster Al Capone's business card list as his occupation? "Used Car Salesman." Spain has a population of 41 million, 94% of whom are Catholic. Spain has 22,670 Catholic parishes with 27,730 priests. On January 14, 1506, Pope Julius II purchased Laocoon, the first artwork acquired by the Vatican Museums, from a Roman vineyard. According to Greek mythology, Laocoon was a priest who tried to convince Troy not to accept the Greek gift of a hollow horse. An indulgence is a remission of the temporal punishment due for sins committed. Diocese of St. Joseph of Irkutsk in Siberia is the largest diocese with 10 million square kilometers. The Diocese of St. Joseph of Irkutsk has 100 parishes serving 50,000 Catholics. In Antioch, Syria, the disciples first took the name "Christians." Saint Clare is the Patron Saint of Television. Father Augustine Tolton was the first person whose both parents were African American to become a Catholic priest in America. Father Tolton was born into a Catholic slave family in 1854 in Missouri. Prior to that, three Healy brothers were priests. The Healy brothers' father was an Irish Catholic Georgian slaveholder and their mother was an African slave. Saint John the Baptist parents were Elizabeth and Zachary. Saint Elizabeth was Mary's cousin. Saint John the Baptist was a disciple of Saint John the Apostle. Brooklyn, New York is known as The Borough of Churches. Matthew means "Gift from God"